Founder at Organization Design Studio, Ltd. Most organizations are like VCRs blinking 12:00. They are poorly designed, out of date and ill-prepared to survive, let alone thrive, in the modern environment (Latham, 2013). When one hears the words “design” and “designer” many people think of fashion, or interior design, or maybe the design of everyday items such as glasses, salt shakers, and so forth. However, everything that is not created by nature is designed by humans, consciously or unconsciously, including organizations and managerial systems. And, thus can be purposefully designed or redesigned to achieve even greater value for the multiple stakeholders. Successful leaders of organization transformation focus on system design. The challenge is to design systems that produce both quality and innovation. There are many approaches to design and design thinking, but the majority of approaches can be summarized into five phases: discover, design, develop, deploy, and iterate (D4+I). The custom “bespoke” collaborative management design framework, practices and considerations presented on this site are organized into nine distinct but related components. The framework is a result of years of experience working with design teams and research on design methods. The design team (participants + design consultants) typically begin by addressing these components in sequence. However, there is often an iterative “back and forth” refinement between the components. 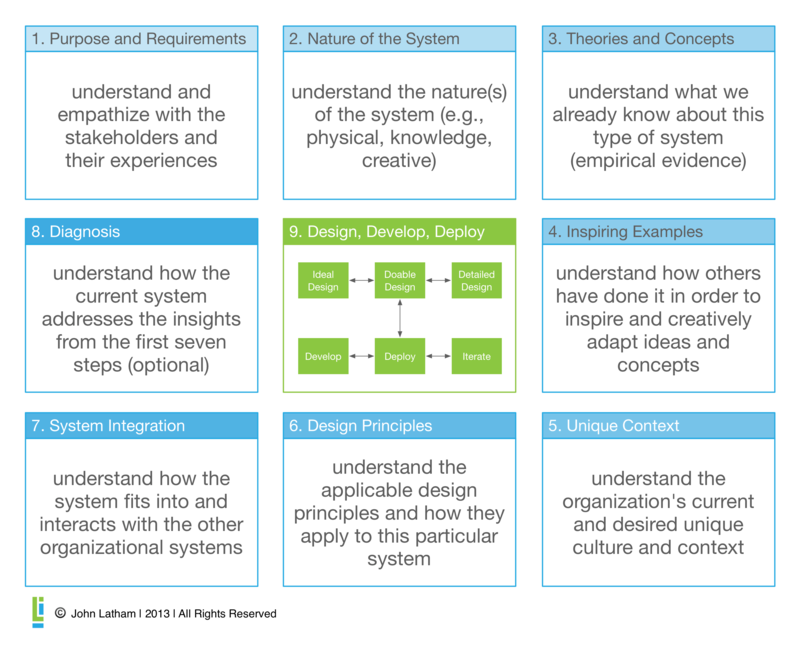 The first eight components are a comprehensive discovery process and provide a “springboard” to the creative design, development, deployment, and iterative improvement process. William McDonough proposes, “design is the first signal of human intention.” Consequently, the first step in design is to define the intent or purpose of the particular system being designed. During this first step the participants develop a clear understanding of the purpose(s) for the system; identify the needs of the stakeholders including key features, functions and components of the system and the associated requirements. Systems and processes differ in many ways but the “nature” of the process will guide many design decisions. Is the system composed of physical processes (manufacturing, transportation, etc. ); knowledge or information processes (loan processing, insurance claims, etc. ); or creative processes (strategy development, product development, etc.)? The nature of the process/system influences design decisions such as the level of process control required, the level of specificity of the various process steps and activities, etc. Understand the key theories and concepts that inform this process. What do we already know about this type of system? What works, what doesn’t work, and under what conditions? Jeffrey Pfeffer and Robert Sutton in their book Hard Facts, Dangerous Half-Truths and Total Nonsense: Profiting from Evidence-Based Management make the point that practitioner’s actions and practices are often not based on the latest scientific theory and are often practices that we already know do not work. World class examples bring the theories and concepts “alive.” Participants review and explore how high performing organizations have applied the concepts to their particular organizations. This review of example designs helps clarify the concepts and applications and inspire the design team’s creative thinking. Examples are used at two different points in the design process. First, high level conceptual design examples are used during the initial discovery and conceptual design processes. Second, detailed examples are used during the detailed design phase to provide tangible options and ideas. The design of any custom management system is dependent on the specific context of the unique organization. Design team members identify the key factors that will influence the design of a custom system to fit the unique needs of the organization. For example, the appropriate strategic management system for the local “Mom and Pop” grocery store is likely to be a bit different from the appropriate system for a multi-national Fortune 500 company with operations in over 40 countries. Design principles are the desired characteristics of the new system. They are cross-cutting and are used to inform the design. Participants begin with established management system design principles such as balance, sustainability convenience (user friendly), alignment, learning, etc. and then identify any additional characteristics or design principles to consider during the diagnosis and design phases. Understand how this system or process fits within the larger organization system. Most management systems are part of a larger system of management systems that combine to manage the overall enterprise. For example, a strategy system interacts with several other systems including: the enterprise scorecard, governance system, human resource systems, and so forth. A system perspective of the larger enterprise management system helps design management systems that are congruent, aligned, and integrated. Dr. W. Edwards Deming proposed, “if you can’t describe what you’re doing as a process, then you don’t know what you’re doing.” It is very difficult to diagnose an existing system until the details and design of the system are made explicit. If there is an existing system, participants describe the key characteristics of the existing system in sufficient detail to provide a common understanding for the diagnosis. Want to learn more about the design framework and the “art” and “science” of organization and management design? Check out the papers, presentations, and online articles on the resource page. Explore the Management Design Resources. Reaching your organization’s full potential, demands organization and managerial systems that are custom tailored to your unique situation. This 65-page eBook (PDF) is an introduction to all the key elements of the award-winning, peer-reviewed Design Framework including the 8-step Discovery process and the Design, Development, Deployment, and Iterate phases. The book is based on both experience and research on organization and management system design.